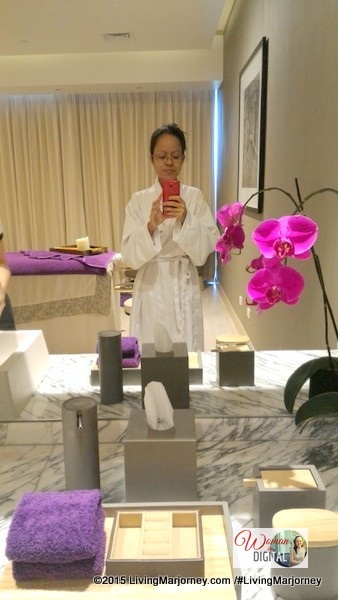 I went to Nobu Spa located at Nobu Hotel Manila located at the City of Deams Manila compound to try their 'Renewal' body massage. Riding an UBER car (use my uber code UBERMarjorieUy and get P100 coupon) I made it to my appointment at Nobu Spa on time. 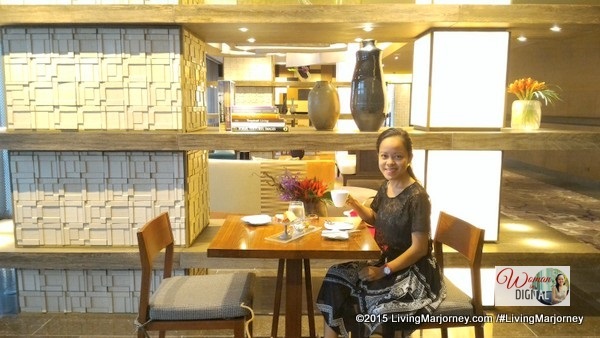 At the lobby, I was assisted by a friendly staff and ushered me to Nobu Spa. I was asked to complete a medical questionnaire. The survey gives the therapist information of my past and present medical status. It will also give her an idea what specific body part I felt discomfort, pain or stiffness. I placed there right shoulder, lower back and legs. 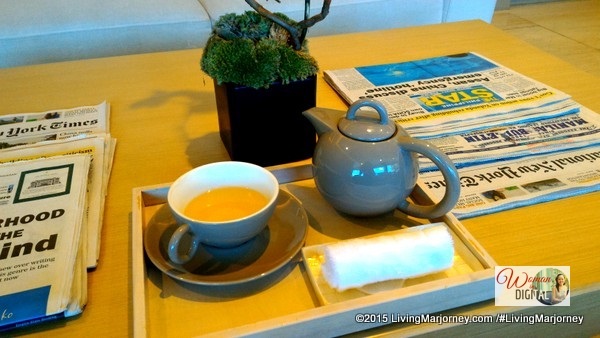 While having a delicious tea which I was told came from Japan, a staff came and offered clean bathrobe and soft, in house slippers. 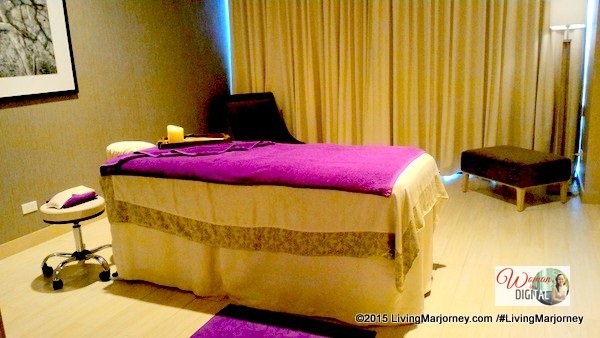 They offer several types of massage or treatments. I tried the Nobu Spa's Renewal Body Massage, It's a fusion of yoga stretches, Swedish massage techniques and acupressure movements using relaxing oil. There were four oil variants but I chose Allure. If you're thinking what Allure means, well that's it, lol! I love the light floral scent though. 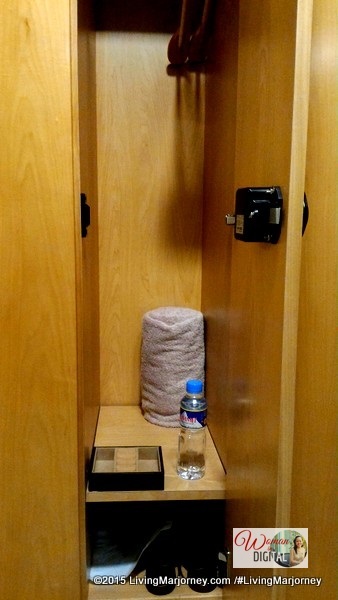 At the changing room, there are lockers and complete toiletries - alcohol, lotion, mouthwash except for talcum powder. The room was clean and organized. Inside the locker were two hangers, rolled towel, jewelry box, plastic bag for soiled clothing and a bottled water. 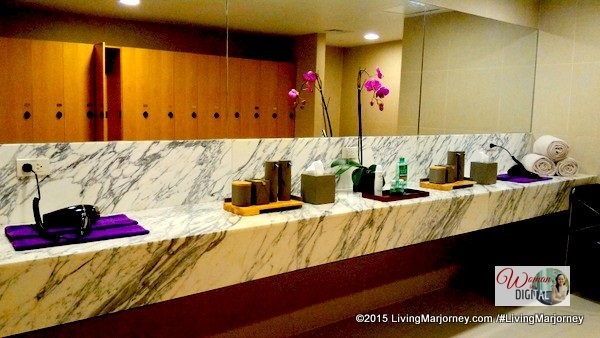 I love the Nobu spa's motiff. Everything in purple including the flowers. 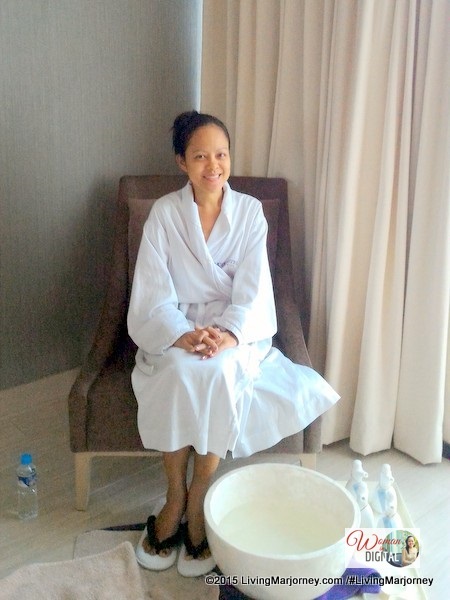 My therapist, Christy Pace started the treatment by washing my feet with warm water and scrub. Then she asked me to choose from four essential oils. She recommended calming and allure. I chose the later. When I smelled the oil, I knew I'm in for a soothing body massage. 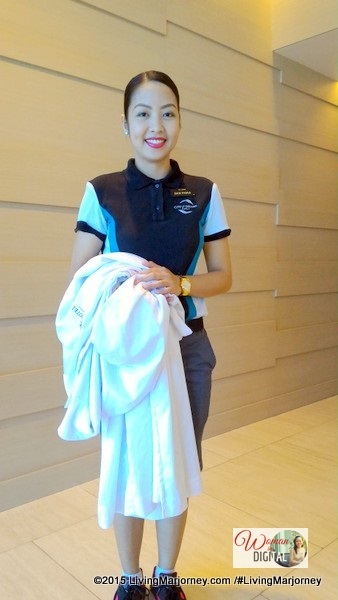 My last treatment was about two or three weeks ago at Glow Spa in Club Paradise Palawan. 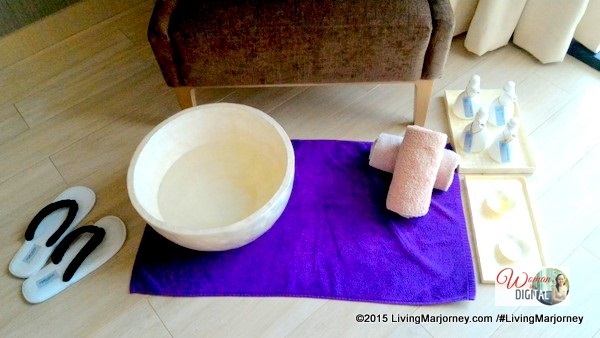 The treatment started with deep breathing exercises which I never experienced in other spas. Followed by massaging the lower extremities - legs and thigh. She noticed my feet cold so she offered if I wanted to adjust the room temperature. Even the volume of music and lighting. I should commend her being very professional and really knows what she's doing. After the back massage it was then the head part of the bed was carefully raised. I remembered Nobu uses hydraulic bed. She continued massaging my legs (front area). It felt more comfortable and relaxed. I guess it helps in proper blood circulation too. 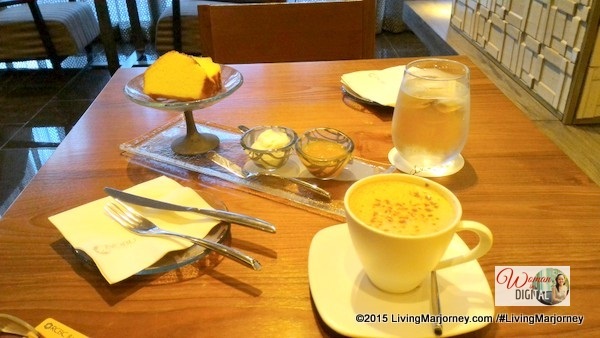 After the renewal body massage, I went to Nobu Lounge for a quick snack. 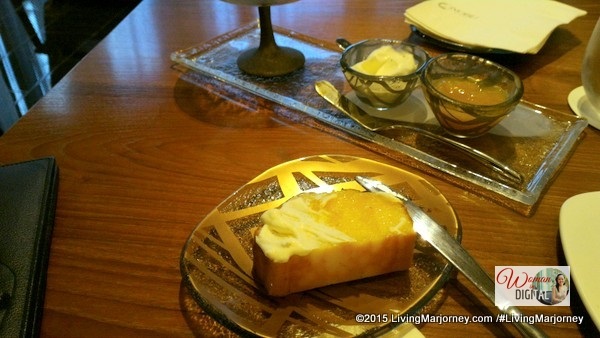 Sitting in a cozy corner at the hotel lounge while enjoying a cup of hot chocolate (P240) and two slices of pound cake (P160+) served with two kinds of spread (mango jam and cream) all by myself. Indeed, it was a well-spent #meTime at Nobu Spa and Nobu lounge.